October 9, 2017 is the twentieth anniversary of the first Messenger Appreciation Day (10-9 Day) in Toronto. It was first proclaimed jointly by Toronto Mayor Barbara Hall and Metro Chairman Alan Tonks on October 9, 1997. During the 1990’s Toronto messengers, often found themselves under attack by politicians, media and even fellow cyclists. In February 1996, Keefe McLaverty became the first Toronto bike courier killed on the job in the modern era. During the summer of 1996, two cyclists, Erin Krauser and Martha Kennedy were killed by trucks within a ten day period. The overwhelming publicity led the City to request The Board of Management to prepare a report on “Enhancing Bicycle Safety.” The resulting report made no recommendations regarding bike messengers but when it came before Council in February 1997, Toronto Councillors passed a motion for staff to explore the licensing of bike messengers as a solution to solving the problem of motor vehicles killing cyclists. Ward 9 Councillor Steve Ellis used the deaths of Toronto cyclists Keefe McLaverty, Erin Krauser and Martha Kennedy to vilify and condemn the Toronto messenger community. Toronto’s bike messengers were portrayed as a cadre of couriering kamikazes, mayhem messengering menaces, wheeling wild warriors, a pedal pushing tribe of reckless road raging rebels. In reality Toronto’s messengers were contributing to the city, supporting the communities and playing an important role in the development and growth of the city’s economy. In 1996, when Bicycling! Magazine named Toronto the best city for cycling in North America, it cited Toronto’s bike messenger community as a contributing factor. Toronto messengers, led by Derek Chadbourne and Sarah Hood hosted an annual community relay bike race at College Park, (St Stephen’s Courier Classic) among bike couriers, police officers and firemen that raised thousands of dollars for St Stephens Community House. 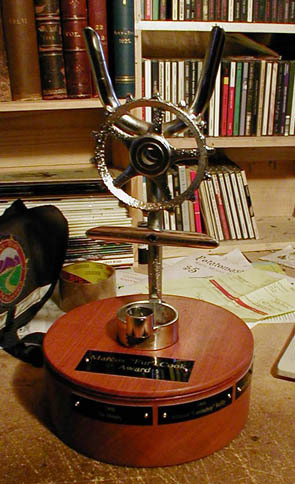 In 1995 Toronto brought hundreds of messengers to the city for the third annual (and first in North America) Cycle Messenger World Championships which Much Music broadcasted live to the entire country. 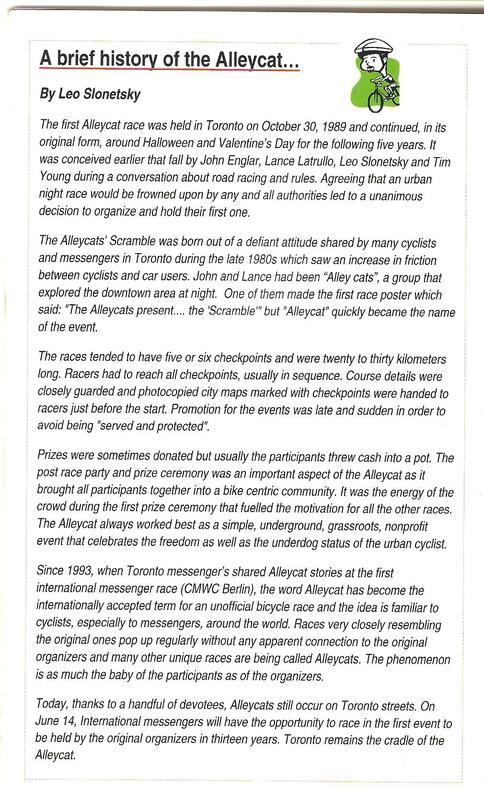 “The Alley Cats”, a group of Toronto messengers and ex-messengers led by Johnny “Jet Fuel” Englar, developed, promoted and organized a style of urban bike racing, (Alley cat Race) that has become popular all over the world and bears their name even today. In 1996, the Alley Cats, led by Johnny Jet Fuel also brought the “Alley Cats Scramble” or “Human Powered Roller Coaster” to Vancouver and Toronto. It was a corporate sponsored cultural event centred around a wooden figure-8 velodrome while independent and international music acts like Run DMC and Fishbone performed live. Toronto’s messenger community also had its own restaurant and bar, Breadspreads (Standby Café) near the corner of Yonge Street and Temperance Street, owned by former messenger by Jayne Hart. Breadspreads/Stand By was also the scene of many of Toronto bike messenger, Trevor Hughes’ famous messenger portraits that continue to inspire culture and fashion around the world today. At the same Derek Chadbourne published “Hideousewhitenoise” an urban cycling magazine focused on bike couriers and utilitarian cyclists. Also during this period, Toronto messenger Wayne Scott battled Revenue Canada in the courts to change Canadian tax law to allow bicycle and foot messengers to deduct their extra food intake as a fuel expense for income tax purposes. Scott would ultimately win this battle in 1998. Fortunately for Toronto, the city’s staff supported its messengers allowing messengers the use of an office at City Hall and access to many archives and files to prepare a response to the scapegoating of the messenger community. The response led to a report from messengers to council and a follow up promotion for the city to proclaim October 9, 1997 as Messenger Appreciation Day. Messengers expected a long battle that would actually result in 1998 as the city’s first Messenger Appreciation Day but the response was overwhelming. Within a couple of days, Councillor (and future NDP leader) Jack Layton personally called messengers offering his full support. The City of Toronto and the Municipality of Metropolitan Toronto proclaimed Messenger Appreciation Day. The Mayor of North York, Mel Lastman proclaimed it there too. We were so surprised by the city’s action that we had no plans to celebrate that year until Sarah Hood contacted the media and many businesses that relied upon messenger services. Sarah arranged for businesses to offer small gifts, snacks and even beer (after work) to show their appreciation of the city’s messengers. Sarah arranged for media interviews and newspapers articles on such short notice. The first and all Messenger Appreciation Days in Toronto owe a huge thank you to Sarah! The first Messenger Appreciation Day in Toronto also owes a large thank you to late Toronto Councillor Dan Leckie. During the 1990’s one of the Toronto messenger community’s greatest allies at city hall was bike planner Barb Wentworth. On very short notice she arranged for Councillor Leckie to present the first proclamation at Urbane Cyclist but I couldn’t make it there on time to receive it. Back in those days you could just walk right in to a Councillors office and talk to them directly. I rode over to City Hall, went to his office and apologized to him and presented him with one of the two Messenger Appreciation t-shirts I had made. I knew Councillior Leckie was himself a cyclist as he was the Chair of the Toronto City Cycling Committee. Councillor Leckie was probably one of the most genuine people at City Hall. He asked me to autograph the t-shirt as he wanted to keep it to remember this important day. No media, no photo opportunity, no one else around, just a City Councillor and his constituent. Councillor Leckie passed away a few months later from a brain aneurysm. Toronto renamed part of Portland Street, “Dan Leckie Way” in his honour. The next year we were better prepared to celebrate Messenger Appreciation Day. We closed Temperance Street for the entire day. The city supplied a free breakfast for messengers. Q107 broadcasted live from the Stand By. Free t-shirts were handed out and Councillor Dan Leckie’s good friend Councillor Jack Layton presented an award to Wayne Scott and the Messenger Appreciation Day proclamation to Derek Chadbourne. We finished the day with free beer at the Stand By after work.